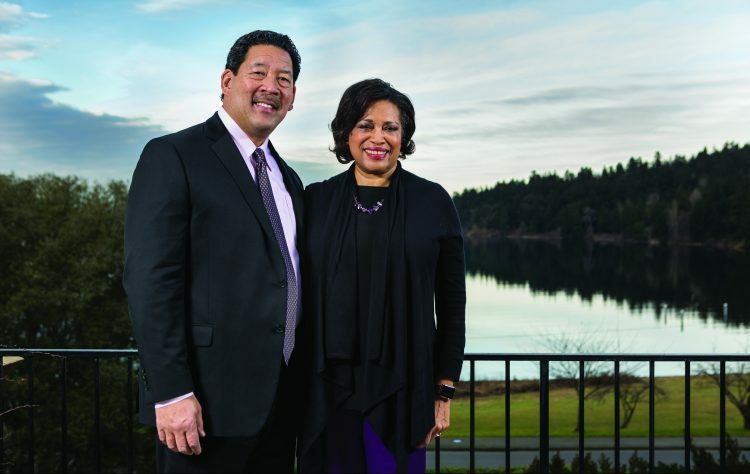 They laugh when you call them a power couple, but UW Regent Joanne Harrell, a Microsoft executive, and Seattle City Councilman Bruce Harrell have earned the title. Their work and public service—both individually and in support of one another—is too great to describe briefly. A snapshot includes heading United Way of King County (Joanne, ’76, ’79), providing pro bono legal work for small businesses (Bruce, ’81, ’84), serving on the Seattle Urban League (Joanne), and volunteering as a trustee with the UW Alumni Association (Bruce). Oh, and Bruce was a 1978 Rose Bowl Champion. Now they can add the Charles Odegaard Award to their list of accomplishments. The campus and community honor, which will be presented to both Harrells at the UW’s Educational Opportunity Program Celebration in May, honors those community leaders who exemplify UW President Odegaard’s commitment to diversity.